For those of us who reside in chillier climates, there’s nothing better than slipping into a soothing hot bath to soak away the winter doldrums. 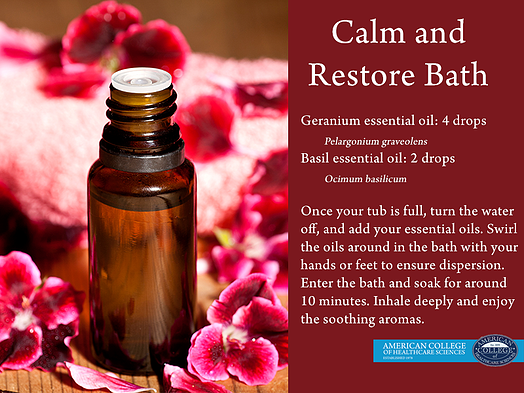 But if you haven’t tried adding essential oils to your bath time routine, you’re missing out! 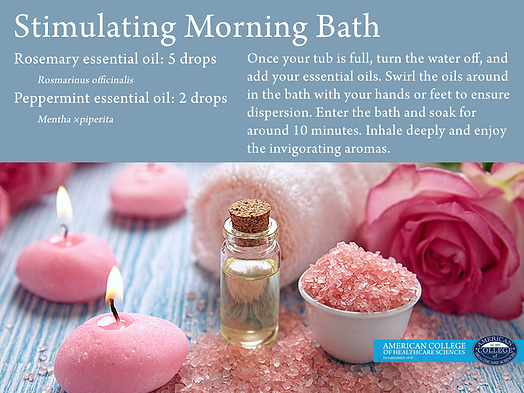 Essential oils can be blended with your favorite base oil and then added to the bath. Or you can learn how to make fizzing herbal bath bombs with essential oils. But if lack of time is a factor in your life, you can add essential oils directly to the bath water. Run the bath water first. While your tub is filling, prepare all you need for a relaxing and comfortable bath. Set up your music, a few cushy towels, a head pillow or folded towel, your favorite cup of herbal tea, candles, and (especially for the parents out there) a “do not disturb” sign for your door. Once your tub is full, turn the water off, and add your essential oils. Swirl the oils around in the bath with your hands or feet to ensure dispersion. Enter the bath and soak for around 10 minutes. For a stress relief-booster, add one cup of Epsom salts. These magnesium sulfate salts mix well with essential oils and water and the extra magnesium gives the added benefit of a deeper, more relaxed sleep. While you soak, be sure to take advantage of this “me” time. Meditate. Practice gentle stretches. Or simply shut your eyes, inhale the enchanting aromas, enjoy the warmth, and be fully present in a moment of peace. Don’t be discouraged if you don’t have a full bath in your home—a hand or footbath can be an excellent alternative. It can be tempting to want to add more than the recommended daily dose (RDD) or stated dose in the formula, but you must resist—a little bit of essential oil goes a long way. Remember that essential oils should never irritate or burn the skin, and if you have skin sensitivities, be sure to do a skin patch test before adding them to the bath. Also, the heat and the water of the bath can enhance absorption, so it’s important to be cautious and use less than you think you need. If you absolutely need to add more, add one drop at a time every five minutes. You may experience slight tingling with essential oils that contain menthol, such as peppermint Mentha ×piperita (L.), but this disappears quickly once you’re out of the bath and dry. The activity of citrus oils in particular can intensify on the skin when mixed with hot bath water, so always remember to use only the stated amount in the formula. Once your tub is full, turn the water off, and add your essential oils. Swirl the oils around in the bath with your hands or feet to ensure dispersion. Enter the bath and soak for around 10 minutes. Inhale deeply and enjoy the invigorating aromas. Once your tub is full, turn the water off, and add your essential oils. Swirl the oils around in the bath with your hands or feet to ensure dispersion. Enter the bath and soak for around 10 minutes. Inhale deeply and enjoy the soothing aromas. You can find all of these oils in one easy >>Aromatic Bath Kit at the Apothecary Shoppe store here. 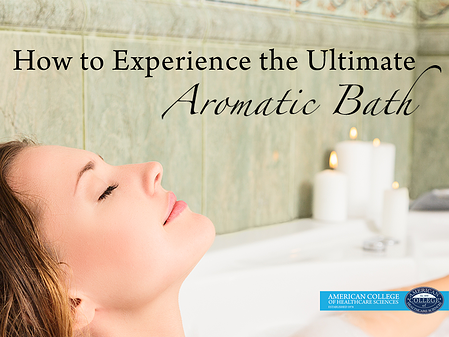 What essential oils will you choose for your ultimate aromatic bath? I’d love to know in the comments. Dorene is the Founding President of the American College of Healthcare Sciences (ACHS). She has over 35 years clinical teaching and lecturing experience in aromatherapy and other holistic health subjects. She has presented papers on essential oils and clinical aromatherapy at the International Federation of Essential Oils and Aroma Trades Annual Conference (IFEAT) in California, USA; the Aroma Environment Association of Japan (AEAJ) in Tokyo, Japan; the Asian Aroma Ingredients Congress (AAIC) and Expo in Bali, Indonesia; the International Center of Advanced Aromatherapy (ICAA) at the WonGwang Digital University in Seoul, Korea; as well as the AAIC Expo in Kunming, Yunnan, China. Dorene currently serves as Chair of the Aromatherapy Registration Council (ARC), and she is also active with the Distance Education Training Council (DETC). Dorene is a travel junkie, and has led ACHS Study Abroad programs to India, Indonesia, Greece, and (in 2018) Hawaii!